It’s sometimes hard to understand a hero’s heart. Thousands of soldiers have fought in Iraq and Afghanistan, and when they return, they often find it difficult, even impossible, to explain what they faced and how they feel. They need to speak, for their own sakes, for healing. We need to hear them, to comprehend their sacrifice and to support them. Fire and Forget can assist us. 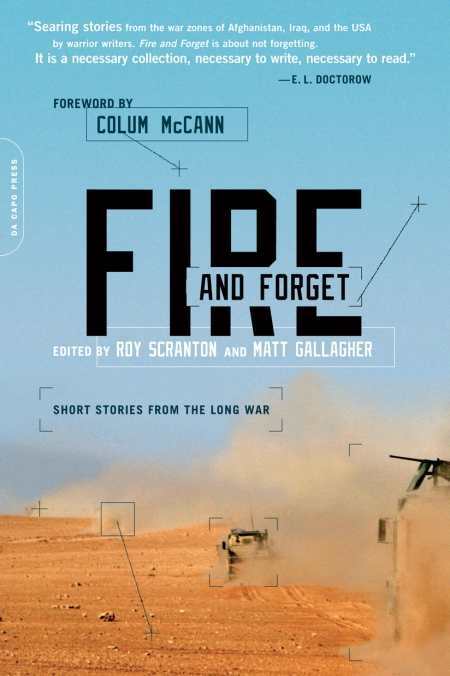 A short-story collection of fiction written by actual soldiers, it emerged out of a project intended to help veterans process their experiences. It also aims to share with readers what soldiers long to tell but cannot express. And it focuses heavily on their lives after they return home. From an inability to find purpose and direction to feeling alone, angry, or unable to cope, the revelations, while hardly surprising, prove deeply insightful. There’s one story about a veteran who desperately wants to tell his wife how he feels but cannot find the words. Without them, he can only lash out. But, “Being angry with her in just the right way never seemed to make her understand.” Another tells of a woman who incessantly rides the subway, the only place that helps her forget a painful event she experienced while serving. Attempting to meet her mother for a few quiet days away, she cannot bring herself to go to even that safe place. Others tell of violent impulses or the inability to pull out of a pained state long enough to get a needed job. One account offers the perspective of the wife reunited with a hurting soldier. Only a few speak directly of the wartime experience. The writing is vivid and compelling, artfully selected by the editors. But it’s heavy. At times, the book is best read in small chunks, as it will strain the emotions. Aside from one story, in which a vet imagines training and commanding wild rabbits to take over a university, little lightens the mood. However, this is an important book. Important for veterans, to know they are not alone. Vital for those who haven’t served, to understand the needs of returning soldiers. And insightful for all, to understand just how great a sacrifice our military members make. Although some may find the reality of what it means to be a hero tough to bear, this collection deserves to be read.